In an online exclusive for Antibullying Week, Stephen James Minton argues that attending to prejudice is the key to improving anti-bullying research and action. The problem of bullying at school is serious and widespread. Each year, towards the end of the school summer holidays, the ‘back to school’ features of the popular print and television media will usually include at least a brief focus on the issue, sometimes reporting the tragedies of young people who have taken their own lives, rather than face having to face being bullied (see Marr and Field’s 2001 book Bullycide). It’s also a pervasive issue. Many of us who went to school in the 20th century, and experienced or witnessed bullying at school, will have read a fictional description of bullying that dated from the mid-19th century (such as that perpetrated by the character ‘Flashman’ in ‘Tom Brown’s Schooldays’). And when the results of the systematic research into the issue of school bullying that began in the 1970s confirmed the impression that many of us had - that if you hadn't been bullied yourself at school, then you must at least have known someone who had been - almost no-one was surprised. Internationally, according to a study of 35 countries conducted by the World Health Organisation in 2004, over one-third of young people reported having taken part in the bullying others at least once in the past couple of months, and over one-third people reported having been bullied at least once in the past couple of months. So what is being done, and can we make such interventions more effective? Large-scale research into bullying at school began with the pioneering efforts of Professor Dan Olweus, in his native Sweden and especially in Norway, where he has been a long-term resident. Olweus has influenced the ways in which school bullying has been defined (usually, as repeated aggression involving a power imbalance between the perpetrator(s) and the target(s)), researched (generally, through the large-scale implementation of self-report measures with school students), and tackled (see Peter K. Smith and colleagues’ 1999 summary of interventions). Famously, three tragic school bullying-related suicides in Norway in 1982 prompted the government to support and fund the first nationwide anti-bullying programme, designed by Olweus, and informed by the data that he had collected. From the late 1980s, researchers elsewhere in Europe, and also in Australasia and North America, used Olweus’ methods (and often, translated versions of his data collection instruments) in establishing the incidence rates of school bullying in their countries, and developing their own anti-bullying programmes, often with large-scale regional or national implementation ambitions. Peter K. Smith and colleagues, in Sheffield and then Goldsmiths University of London, were key to these efforts. Central government support continued for anti-bullying efforts in Norway, and with the announcement of the Manifesto against Bullying in 2004, a package of central-government supported measures at a nationwide level, Norway cemented its position as the world’s leader in the field. Legal reform was a key part of these measures; ultimately rooted in Norwegian perceptions of their responsibilities under international law (i.e. as a signatory to the United Nations’ Declaration on the Rights of the Child), section 9A-1 of the 2002 Education Act spelled out responsibilities for schools and the State in guaranteeing a satisfactory physical and psychosocial environment for all those enrolled in the nation’s schools. The implementation of anti-bullying programmes in schools was effectively mandated, with Olweus' programme and the then newly developed ‘Zero’ programme being offered to all schools in Norway. Whilst there are differences between the two programmes, both are based on the creation of local networks trained by small groups of experts. There’s an emphasis on awareness-raising at a ‘whole-school’ level (i.e. amongst students, parents, teaching and non-teaching staff alike) and the adoption of behaviour management strategies in the schools (i.e. the development of anti-bullying policies, that incorporated measures to deal with and prevent bullying behaviour amongst students). I reviewed such programmes in my 2016 book. There was a large-scale anti-bullying programme in schools in Sheffield as early as 1990-1992, yet in more recent years, the UK has not progressed down the route of a nationally-implemented anti-bullying programme. The experience gained in the Nordic countries would support that, and for many years I have argued for it in Ireland, where I live (see O’ Moore & Minton, 2004). In the absence of such measures, probably the highest profile anti-bullying effort, in the British public conscience, is Anti-Bullying Week, held in schools in the third week of November since 2004. It’s organised in England by the Anti-Bullying Alliance (www.anti-bullyingalliance.org.uk) and in Northern Ireland by the Northern Ireland Anti-Bullying Forum (www.endbullying.org.uk). With a different theme each year, there is an emphasis on the generation of resources and events for and by participating schools. Whilst perhaps not adhering to the emphasis that Olweus has consistently placed on the need for evidence-based, evaluated interventions, we can see the ongoing influence of the Norwegian research and practice in many strategies and resources implemented in British schools in Anti-Bullying Week. Yet 13 years after the measures of the 2003 Manifesto against Bullying, the enthusiasm for direct anti-bullying measures seems to be reduced in Norway, at least in some quarters. In 2016 the national newspaper Aftenposten reported that whilst in 2003, 380 schools started the Zero programme, since 2013, no new schools have done so; and that the number of schools that run the Olweus programme, which was 400 in 2005, has also reduced. The newspaper also claimed that the Norwegian State has spent in excess of 200 million kroner (around £18.4 million) over the last decade on anti-bullying programmes. Has the Norwegian taxpayer been getting value for their money? In other words, how effective have anti-bullying intervention programmes been in Norway, and elsewhere? Worldwide, a 2008 meta-analysis of anti-bullying programmes conducted between 1980 and 2004 by Kenneth Merrell and colleagues concluded that programmes may produce ‘modest’ positive outcomes, but that they are more likely to influence knowledge, attitudes and self-perceptions than they are to influence actual bullying behaviours. David Farrington and Maria Ttofi’s 2009 meta-analysis of 44 anti-bullying intervention programmes conducted between 1983 and 2009 showed that school-based programmes succeeded in reducing self-reports of having bullied others by between 20 per cent and 23 per cent, and self-reports of having been bullied by others by between 17 per cent and 20 per cent. Given the misery caused by school bullying, it can of course be argued that a reduction of up to 20 per cent in the proportion of students reporting that they had been bullied is important. However, on the basis of data collected from the Norwegian National Student Surveys of 2007, 2008 and 2009 (around 260,000 7th–10th grade student participants), Berit Lødding and Nils Vibe have concluded that bullying is not a problem that could be solved by adopting a specific programme; instead, attention should be paid to making improvements generally in the school environment. Perhaps predictably, Dan Olweus attacked Lødding and Vibe’s logic as ‘untenable’, provided evidence of the ‘strong effect’ of the Olweus anti-bullying programme, and described their conclusions as ‘pure speculation’. The message that ‘bullying can happen to anyone’ is undoubtedly helpful in many respects. It can, for example, underscore the general need for us to do something about the issue, and defuse the feelings of being somehow to blame for one’s own bullying. However, over the past two decades in particular, a body of evidence has emerged to support an idea that many feel they have always known: that bullying happens to some people (and significantly, to some groups of people) more than others. When we consider the case of groups who are more generally marginalised, and subject to prejudice outside of the school gates and environment, those students report that they have been bullied in disproportionately higher frequencies (Minton, 2014, 2016). Given the extraordinarily and pervasively high prevalence rates of homophobic bullying in schools, by addressing bullying behaviour in general is one simultaneously addressing the issue of homophobic bullying? I would argue not, and back in 2006 Gerald Walton asserted that ‘even though homophobia is a prominent feature of schoolyard bullying, it is also one of the most unchallenged forms of bullying’. There is also evidence to indicate that members of other so-called ‘minority groups’ - people with physical disabilities and special educational needs, students who belong to ethnic minorities, and students who belong to alternative sub-cultures – report having been bullied more frequently than do their ‘majority’ peers. Ketil Hansen and Tore Sørlie’s 2012 finding that children of indigenous Sami ethnicity are at least twice as likely to report having been bullied in Norwegian schools than are their majority Norwegian ethnicity peers Has raised questions as to whether the provisions regarding the guarantee of a safe psychosocial environment made in the Education Act of 2002 work as well for Sami (and, potentially, other minority) children as they do for the majority. Clearly, from the evidence regarding the bullying of those belonging to various minorities, we cannot be confident that in terms of anti-bullying measures, ’one size fits all’, or at least, we cannot continue to assume that the ‘one size’ that we have traditionally had will ‘fit all’. Things move on, however, and these days, the world’s most widely implemented anti-bullying programme is one that originated in one of Norway’s neighbouring countries. The ‘KiVa’ anti-bullying programme was developed between 2006 and 2009 by Christina Salmivalli and her colleagues at the University of Turku, Finland – you may recall it from the interview with Salmivalli in the April 2014 issue of The Psychologist. KiVa incorporates ten structured lessons (of approximately 90 minutes’ duration) for the 7-9, 10-12 and 13-15 year-old age groups, covering topics such as being part of a team, having respect for others, learning about emotions, group interactions, peer pressure, types of bullying and their consequences, and how individuals and groups can play their parts in reducing bullying. The delivery of the sessions is via small-group and whole-class discussion, role-play, film clips, group work, written assignments and whole-class activities. Training and implementation resources for schools, interactive parental advice and support websites, and on-line games have all been developed, as well as detailed procedures for schools and teachers in dealing with actual incidents of bullying (see Hutchings & Clarkson, 2015). Since 2015, KiVa has been implemented in 90 per cent of comprehensive schools in Finland, and since its first nationwide rolling-out in 2009 evaluations have shown year-on-year reductions in students’ self-reports of having been bullied, and having taken part in the bullying of others. KiVa currently has licensed partners in many countries across the world. In the UK, KiVa has been piloted in Wales, with 14 primary schools in north and south Wales taking part, along with three Cheshire primary schools, with pre- and post-test evaluations (using the Olweus Bully / Victim Questionnaire) showing statistically significant reductions in all participating schools of students’ self-reports of having been bullied, and having taken part in the bullying of others (see Hutchings & Clarkson, 2015). Through its structured work with students in particular, KiVa seems to offer the possibility of a more thorough working through of students’ knowledge, attitudes and behaviour. I feel that it would be interesting to see how students who belong to ‘minorities’ fare in KiVa schools; whilst such variables have not been included in evaluations of KiVa to date, the finding that there was a 27 per cent reduction in the proportion of students who report having been bullied on the basis of their ethnicity or country of origin in the first year of the implementation of KiVa (Salmivalli, Kärnä & Poskiparta, 2011) seems to be an encouraging indication. I have come to see school bullying as just one of the many aspects of the aggressive marginalisation of ‘minority’ populations, so it seems to me that large-scale anti-bullying programmes provide an opportunity to challenge ‘us and them’ thinking and interactions, amongst large groups of people, at formative ages. I also believe that this potential has not, as yet, not been fully realised. It’s not enough to rely on the strategies of awareness-raising and behavioural management. It is for these reasons that I see a continued role for anti-bullying programmes in schools, but in a strategically revised form - with thorough attention being given to the importance to the role of prejudice as an underlying factor in bullying, and in other forms of aggressive marginalisation. - Stephen James Minton is a Chartered Psychologist in the School of Education, Trinity College Dublin. Hansen, K. L., & Sørlie, T. (2012). Ethnic discrimination and psychological distress: A study of Sami and non-Sami populations in Norway. Transcultural Psychiatry, 49, 26–50. Hutchings, J. & Clarkson, S. (2015). Introducing and piloting the KiVa bullying prevention programme in the UK. Educational and Child Psychology, 32(1): 49-61. Lile, H. & Hansen, K. L. (2012)[ Presentasjon av prosjektet ‘Psykososial helse i skolen’ [Presentation on the ‘psychosocial health in school’ project]. Konferanse om retten til psykososial helse i skolen [Conference on the Right to Psychosocial Health in School], University of Tromsø, Norway, October 12th. Lødding, B., & Vibe, N. (2010). Hvis noen forteller om mobbing…. Utdypende undersøkelse av funn i Elevundersøkelsen om mobbing, urettferdig behandling og diskriminering. [If someone reports bullying…. Main survey findings in the student survey about bullying, unfair treatment and discrimination]. Rapport 48/2010. Oslo: NIFU. Marr, N. & Field, T. (2001). Bullycide: Death at Playtime. Oxon: Success Unlimited. Merrell, K. W., Gueldner, B. A., Ross, S. W., & Isava, D. M. (2008). 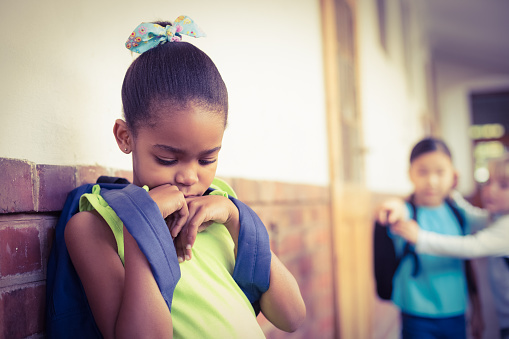 How effective are school bullying intervention programs? A meta-analysis of intervention research. School Psychology Quarterly, 23(1): 26–42. doi:10.1037/1045-3830.23.1.26. Minton, S.J. (2016). Marginalisation and Aggression from Bullying to Genocide: Critical Educational and Psychological Approaches. Rotterdam: Sense Publishers. Olweus, D., & Breivik, K. (2011). Mobbing, læringsmiljø og Olweus-programmet. [Bullying, learning environment and the Olweus programme]. Utdanning, 8(20): 36. O’ Moore, A.M. & Minton, S.J. (2004). Dealing with Bullying in Schools: A Training Manual for Teachers, Parents and Other Professionals. London: Paul Chapman Publishing. Salmivalli, C. (2016). Anne Marie Jones Memorial Lecture: ‘Creating safe learning environments by reducing bullying: What can schools, parents, and students do?’ Bangor University, February 1st. Smith, P.K. (2003) (ed). Violence in Schools: The Response in Europe. London: Routledge. Smith, P.K. ; Morita, Y.; Junger-Tas, J.; Olweus, D.; Catalano, R.F. & Slee, P. (1999) (eds). The Nature of School Bullying: A Cross National Perspective. London: Routledge. Smith, P.K. ; Pepler, D. & Rigby, K. (2004). Bullying in Schools: How Effective Can Interventions Be? Cambridge University Press. Svarstad, J. (2016). Skolene dropper programmene mot mobbing. [Schools dropping anti-bullying programmes]. Aftenposten, June 8th. Walton, G. (2006). H-cubed: A primer on bullying and sexuality diversity for educators. Professional Development Perspectives, 6: 13–20. World Health Organisation (2004). Young People’s Health in Context: Health Behaviour in School-aged Children (HSBC) Study: Intermediate Report from 2001 / 2002 Survey. In Health Policy for Children and Adolescents, 4. World Health Organisation.